Patch 3.8, major changes to all energy related items and most heroes energy consumption so that energy management becomes a factor. Since those changes were made some heroes developed very noticeable energy problems such as Samuel Skaarf Celeste that basically force you to rush chargers before completing spellfire and you’re gonna have to build either an eve or a clockwork otherwise you suffer energy problems in the mid and late game. On the other hand you have San Feng who literally uses 0 energy and now Caine the new hero is also set to have 0 energy consumption (hopefully i am allowed to sneak that little piece of information). So some heroes suffer immensely from energy problems and now they keep adding heroes where energy is not a factor that you have to concern how does that make any sense ? But has bullets, which is actually more restrictive (if it wasn’t for his B). You just gotta play the superior heroes. Meh. Energy management is something I’m glad they’re taking seriously, as it is one of the ways to keep cp heroes in check and also let them be op, but they need to get better at it. Heroes needed energy to be a factor a long time ago. It’s likely mistaken management. Clearly energy can be tweaked for heroes on a minute scale and is effective as such long term, so little effort in energy balance lately to me says someone, be it managers or workers, doesn’t want it to be priority. Never had a problem with cp mangement as Lyra and Malene so we are happy. The problem isn’t that you have to manage your energy on some heroes, its that some heroes don’t need any management at all. Power creep. SEMC did an utter failure to deal with it. I don’t think it needs an explanation. 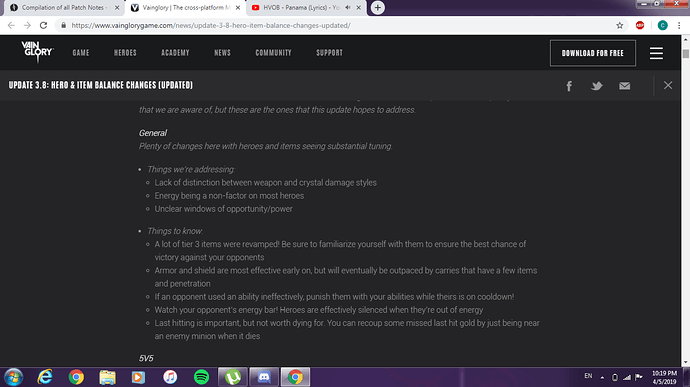 I was cristal clear since release Anka and her not getting a nerf for 3 months. Sigh… As Nerf used to say: State of the game in 2019. You have to be soooo conservative with early game lyra until u get chargers. I mean I’d say it’s both. Anka doesn’t need another nerf, she is in a good position. Never said she needed one but ok. I just pointed out that power creep was an issue that became obvious for everyone to see when Anka was released. No need for you to pick random comments and start an unrelated discussion about boring game stats and balance shenanigans that will only end in people repeating themselves, waste everyone’s time, derail this thread and therefore getting it closed. Thank you. I was cristal clear since release Anka and her not getting a nerf for 3 months. I though you were saying that right now its been 3 months without a nerf and that shee needed it. I didnt say any stat nor a balance shenanigans. I just misunderstood what you said, nothing more, but now ive seen who i cant talk with again. Have a good day, im out. I don’t play a lot of Skaarf, but Samuel and Celeste feel fine to me. Celeste basically needs to build a tier 2 battery ASAP, but other than that she’s not too different. I tend to build Clockwork, EvE, or Chargers earlier than before, but my target builds aren’t different. On Samuel, I don’t notice energy. His perk feeds him enough energy that I can usually do something else for my first tier 3 item, then rush Clockwork or Chargers. There are heroes I feel should have more energy problems, but that’s a matter of the hero having costs that are too low. San Feng doesn’t bug me (not about energy anyway) because his abilities are limited by their cooldown instead. Inara is the same way (energy is virtually irrelevant for her after level 8, but the length of her cooldowns seems balanced). Wasn’t there an update where SEMC mentioned the importance of energy management? And that heroes would be more vulnerable if energy was depleted/mismanaged? Then they come out with two heroes that don’t require use of energy.